Potted flowers line the streets at the Cours Saleya Flower Market in the Old Town of Nice in France, Europe. An impressive display of potted flowers are on sale at the Cours Saleya market on a weekly basis in the Old Town of Nice in the Provence, France. Amongst the market stalls that are adorned with beautifully colored potted flowers you will also find cafes, souvenir shops and fresh vegetable and produce stalls. The market in the Old Town of Nice in the Provence, France has many different species, shapes and sizes of potted plants in an assortment of vibrant colours. 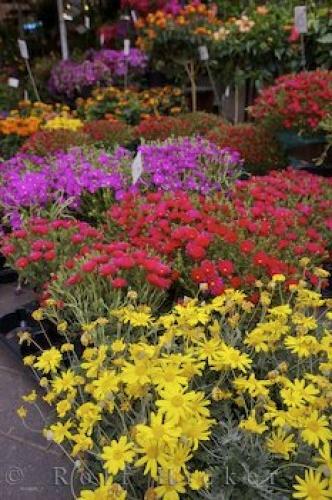 If you are a plant lover, then a walk through all of the potted flowers can sometimes take a couple of hours to make a final decision on which one you want. Old Town of Nice in France, Europe. I photographed this photo with the digital SLR camera model Canon EOS-1Ds Mark II, aperture of f/5.6, exposure time of 1/160 sec. on ISO 100, as always I used a original Canon Lens, the focus lenght for this picture was 24mm.